Looks like the full set of drama posters is now complete for the Korean adaptation of well known Chinese time-traveling period novel Bu Bu Jing Xin (Startling with Each Step). Moon Lovers: Scarlet Heart: Ryeo will premiere on SBS Mon-Tues starting August 29th, and with it all these drama posters will get plenty of limelight and for that I’m mostly disappointed with the stylings. 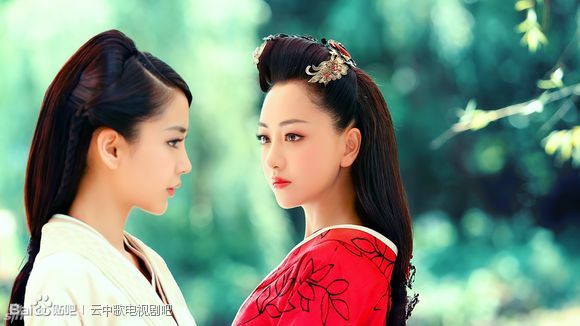 The C-drama posters were visually innovative and didn’t oversell the romance, instead focusing on the central position of the modern female lead who needs to navigate the palace intrigue and court battles of the historical era. 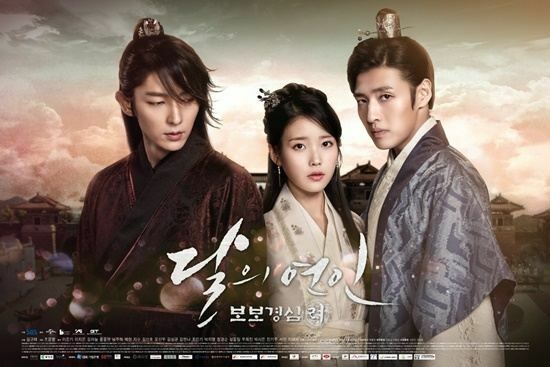 Here the drama posters make the OTP romance of Lee Jun Ki and IU feel overwrought, and then another poster turns it into the typical K-drama love triangle adding Kang Ha Neul when the original was anything but typical. Oh well, not everything can be a win and I’d rather take a solid cast and great drama over pretty posters so SBS better give me the former when the drama airs. And below is the first Chinese drama poster released a few weeks ago featuring the entire cast. Can we have this one for the K-version as well? 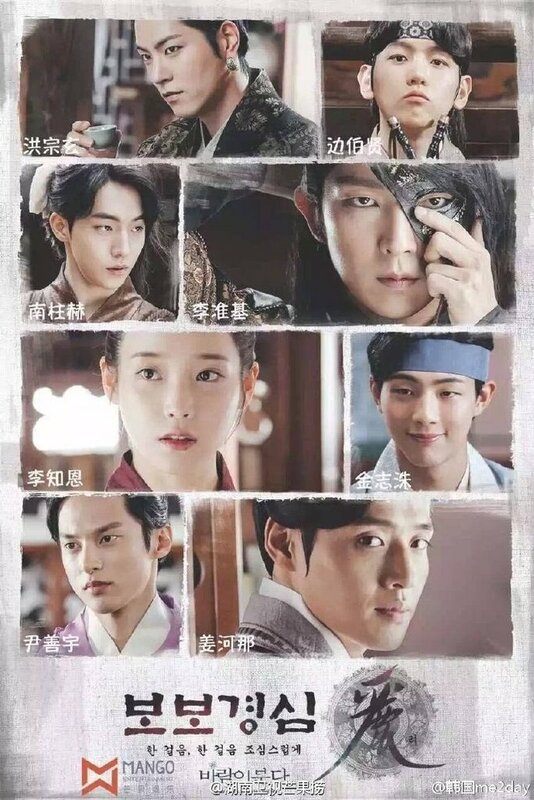 It does seem that this version is not placing Haesoo as the central figure, which is a shame, though I guess LJK fans are not exactly disappointed 🙂 If anyone watched empress of zhen huan which features the same emperor (4th) of BBJX, did anyone imagine Ruoxi navigating such scheming? 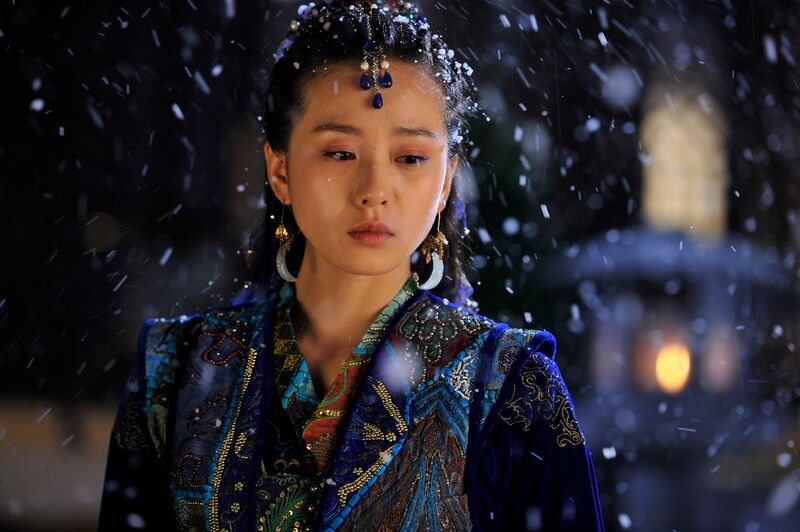 BBJX was about Ruoxi reacting to the inevitable political intrigue. Does it fully portray the full finesse of Ruoxi’s adaptation and the court’s shenigans? I would not say so after reflection, but BBJX was more fairy tale like. Kind of like Disney Cinderella, with a simple story and somehow, so poignant..
I’m looking forward to ML too though, since it’s an adaptation, I guess Haesoo would also be slightly different, with traits retained from her novel counterpart. I guess this actress is going to receive the most ‘feedback’ because it’s easier to compare her than the more action-oriented actors in this version. Since people like flooding this site with comparison comments, would anyone care to compare the c- and the k- drama adaptation? I loved BBJX and anticipating ML, so this would be fun? So,… I doubt Haesoo gets pregnant in this one.. 3rd prince appears to shadow the crown prince in the original with his desire for the throne- he might have asked for Haesoo if there was the horse-riding tribe…and a reason why I thought Ruoxi-13th was so cherished was Hongshi-in this adaptation, with reduced screen time, I guess they will focus more on his romance with the geisha… and I guess people would say that the other actors become soy sauce when LJK is around with no effort required.. I think fair comparisons would be hard since SH hasn’t aired, but from the look of it I have a feeling that political/ power struggle aside, Korean SH will put at its centre the romance/ bromance, as opposed to the Chinese SH which focuses more on exploring all types of relationships (romance, friendship, sisterhood, brotherhood, subject/servants’ loyalty). Given the reduced screentime for Korean SH, I imagine this being difficult. Plus romance/ bromance is Korean dramas’ forte, so it is understandable that they will give more priority to such aspects. Only as a viewer, I would prefer to see more plot points and depth than just mere romance. The novel was narrated from the heroine’s viewpoint, so I would also expect to see Haesoo as the protagonist, rather than LJK or any other princes. It’d also be interesting to see more dynamics between Haesoo and 4th prince, rather than just him stealing the spotlight all the time, because I know LJK is capable of doing that well. I don’t want to speak too soon but from the teaser I don’t think I’ll have to worry about this, as IU seems to find the balance between herself and LJK in the highlighted scenes, but I know we’ll have the whole drama to judge. This is just a personal preference, but I wish they would reduce the screentime for fan services (aka bath scenes) and focus on other plot points instead. A quality drama with strong script and good cast would not need such tactics to boost its viewership imho. The princes may have more screen time compare to C-version but Haesoo will remain the main spotlight (it was also said in V app, she is the main role). I love the c version bec. Of how they execute the story without changing the history but use the character of Rouxi to let the events happened. Which I want the K version will give. But I see differently, the k version seems want to give new one far from c version. I also don’t want to compare this two,I wish that this version to have its own charm. Yes. He was huge post The King and the Clown. He has done a good job post military of maintaining his popularity. He was big as how SJK, KSH and LMH is today. 2006 was basically his year. The unique fact about LJK is he shot to superstardom not for portraying a macho alpha-male prince charming as how the current Hallyu stars are instead it was for playing a sissy homosexual clown and he started off as movie actor, not a drama actor. His career and popularity longevity is worth noting, though. haven’t watch the C-version. but i hope this one focuses more on the plot than love triangles. then again,kdrama is just like the CW network. they can’t do without their love triangles. 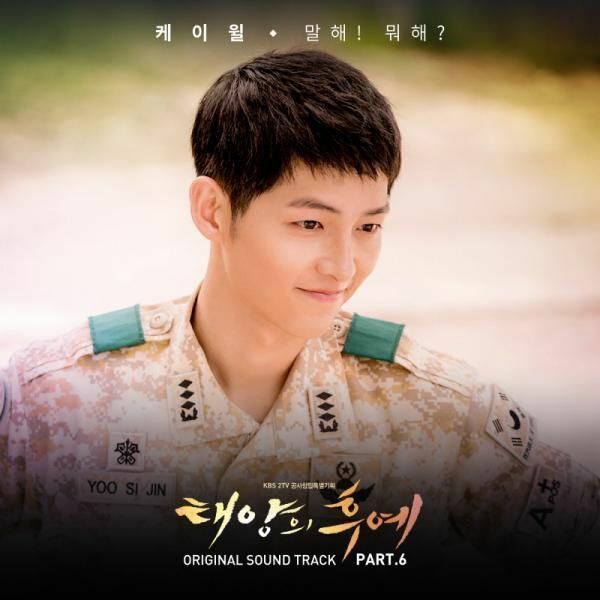 When i saw the first poster, my first impression is “Wow, the leading man is more beautiful than the leading lady”. Yes, that’s the problem when co-starring opposite LJK, his beautiful visage is hard to match and he is so charismatic and commanding on screen that he litterally steal the scenes. I trust him to sell the story. I have a feeling that the K-BBJX is indeed more LJK’s centric but as long as the storyline not running far out of the original, I think the drama will do well but I think the most interesting part of the K-version would be the political conflict and battle of the throne which will be more raging compare with the subtle tone of the C-version befitting the time setting that the K-version has chosen. Me prefer the warriors than the scholars battle. Looking forward and now it’s less than 2 weeks to go. K-drama as expected tends to bend more on the love story but I have no complaint on that as long as the essence of the original novel is still there. I think the posters are breathtaking, though. I guess with LJK taking center stage, I am not surprised why the poster not showing IU’s journey navigation. So far, the posters, stills, teasers and trailer sell so I am praying hard that the drama will live up to expectation. The tension is rising but I am positive it will be good. I don’t have a strong feeling about the posters one way or another, but I do think they work well for the Korean audience that tends to want the romance so, in that sense, it works. While I’ve mentioned before I want this to be female centric like the c-drama, they are dealing with Korean history and that has to be addressed as well. A lot of the plotting and planning in the c-drama was cerebral and sneaky versus actual battles. 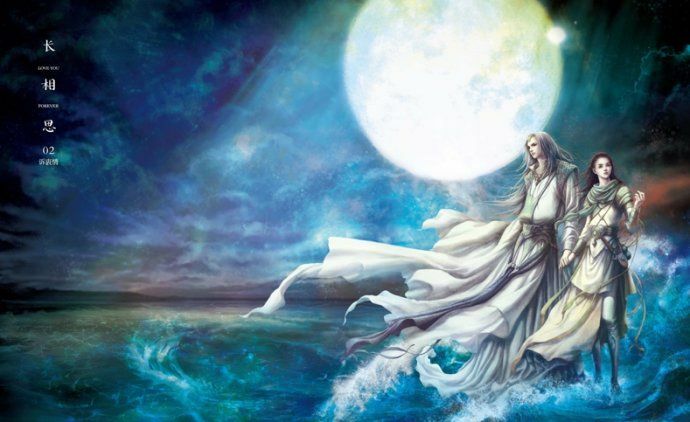 I hate love triangles, but I have to say the c-drama version of this is the best I’ve ever seen and I actually get it and it made sense the way it was done. I am crossing my fingers they keep that story intact. I am also happy that this isn’t as long as the c-drama which was paced very well, but I still felt it was 7 plus episodes too long and given the 45 minutes time versus the 1 hour here, I am hoping the k-drama gets it right. 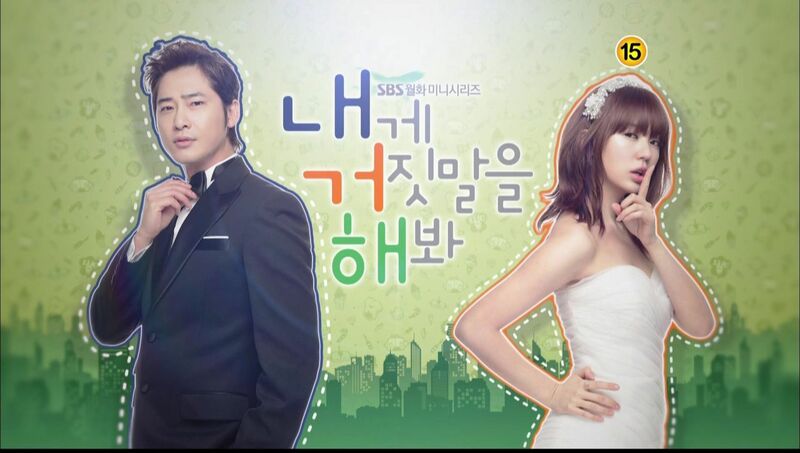 I am keeping my expectations middle of the road; when it comes to k-drama viewing, that’s the best bet. I am also looking forward to this drama. I do believe iu will be able to do this role well. I saw her in the pretty man aka bel ami drama and she did a good job in that role so she should be able to do this role. I also liked the ruoxi 13th prince friendship in the c version and I am hoping they have that friendship in this version.